« Time to Rest Really Helps! 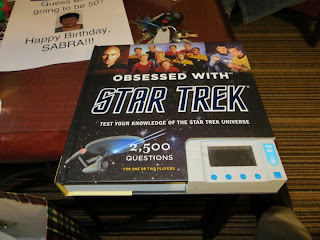 2500 Trivia Questions? That will keep me busy! For the last few years we have celebrated holiday-related gifting around the Thanksgiving period. Why? It’s easier for my sister and brother-in-law who have to drive to Iowa. The weather is usually much better in November. I remember driving to see Mom at Christmas time when the roads to Missouri were barely navigable… not to mention crowded as heck. With Mom gone nearly two years now, Sis prefers to travel north instead of Dad and I going to Kansas City. For the last few days, my sister and brother-in-law have been in town. They arrived on Thursday. Unfortunately, about the time they showed up, so did the stomach flu. It took me out for a day. I was too weak to eat or do anything for nearly 18 hours. It was a strong bug! Today I was back up and running to some degree. That’s good – we had some ground to cover. This afternoon the four of us went for a drive to a neighboring town in search of a grave. 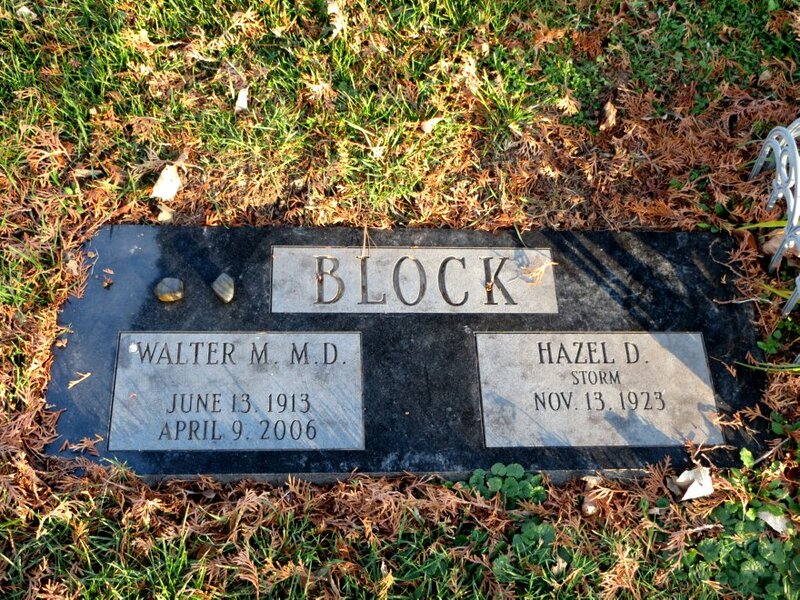 My sister and I used to see a pediatrician for many years who is buried near Ely, Iowa. We paused to place polished pebbles on his grave. According to my sister (who is studying to be Jewish), placing rocks is a Jewish tradition. 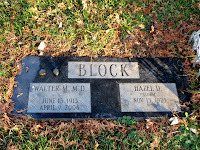 Dr. Walter Block was a well known, beloved physician in this area. He was a German Jew who fled Nazi persecution. It was good to honor him today. 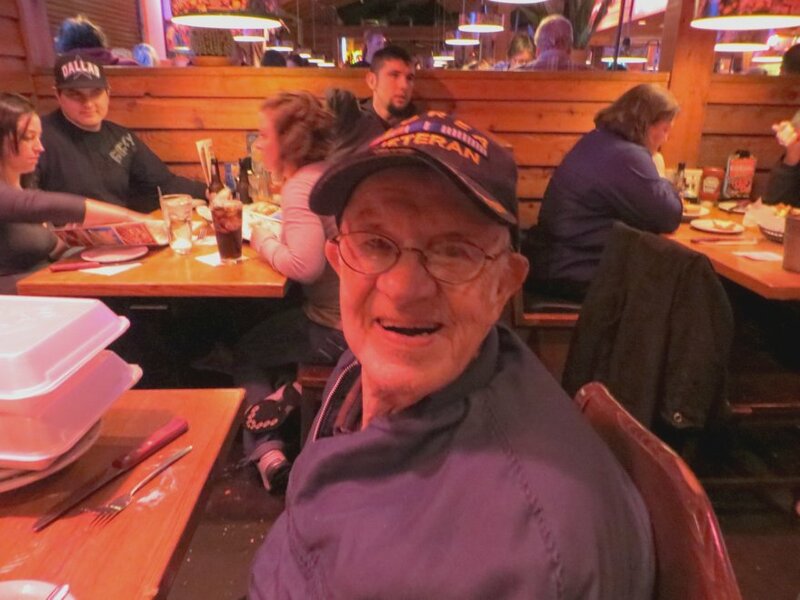 Many who live in this area know of the contributions of this fine man… but oh, as a child he struck terror into me with his thick German accent lecturing about my bad vocabulary that was built by Grandpa Harris and Uncle Clifford – two of the best fishermen in north east Iowa! “Heffens! You vill be judged by your friends for za verds you use!” He scared the [censored] out of that little boy! As I recall, those doctor visits (just before school started) were always right after spending a summer week at the Grandparents’ house and trout fishing. 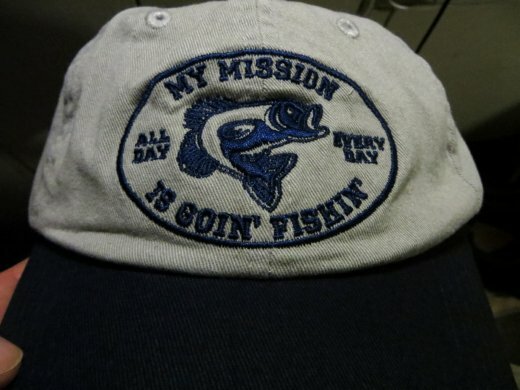 Almost forty years later I still fish there… and use some of the same words. after enjoying a New York Strip steak. The place was packed! I’m not used to eating at busy restaurants. One gets spoiled by the quiet solitude of dining next to a trout stream. But the steaks were so tasty that it was easy to overlook the high noise level. After being alone so much, it was almost preferable! My sister had a wonderful meal of rotisserie style chicken. When she finished, I did the work of picking the chicken bones clean to make sure and have a treat to bring home for my tiger striped tomcat buddy, Jesse James. He cleaned up the chicken scraps in short order. Can you blame him? Our family celebration was at the hotel where Sis was staying. I wanted to share some pictures with the readers. To the right is the scarf made for her. She requested it be as close to 12″ x 60″ as possible. I wondered how the heck she would wear this thing! It looked like a carpet runner. Tonight that question was answered. She is folding the scarf in half longitudinally so it is 6″ wide. It looks great and should match her clothing. She was delighted with it. 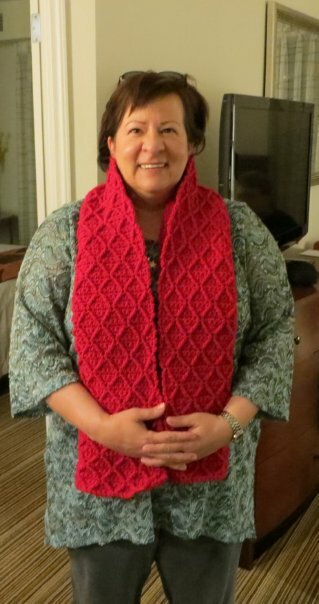 Much of the scarf was made during the presidential debates. I screwed it up during the third debate and had to tear out some of the work and redo it… I got too excited during that exchange! That wasn’t all the crocheting that happened. Remember the hat with ear flaps shown on a previous post? I whipped one out for Dad in an hour and a half! His is in dark coffee color. Maybe next year I can make them and sell them on here… That would be fun. 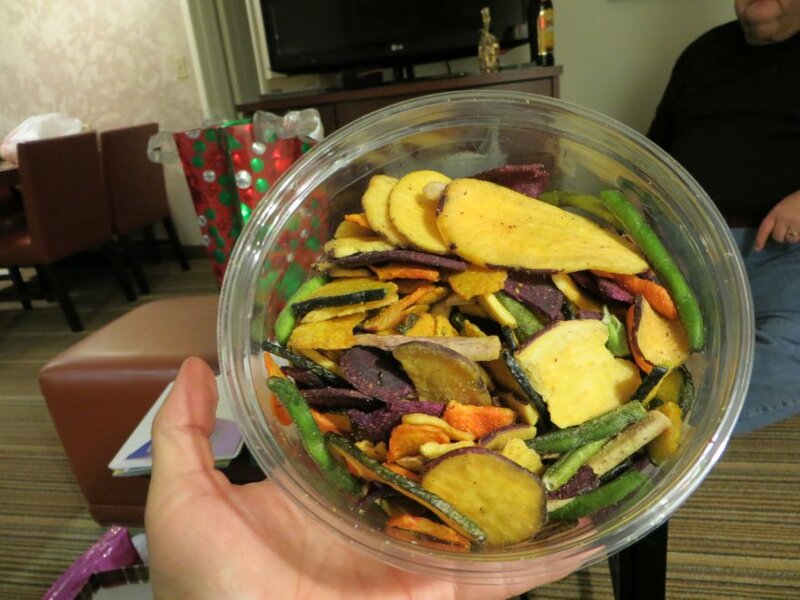 I also gave Sis a couple of goodies from the [kosher] Glatt Market in Postville, Iowa. She received her first Hanukkah candle as well as some sugar free kosher tea biscuits. To go with she got a big gift card from Caribou Coffee… Gotta have that mocha-cappa-frappa-expressa-chino thing with whipped cream and sprinkles on top… or whatever that foo-foo coffee drink is. My brother in law did pretty well, too. 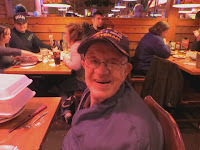 A gift card to Barnes and Noble and a bottle of Kahlua brought a smile to his face! I also bought him a bag of the nuns’ caramels from Our Lady of the Mississippi Abbey in Dubuque. Books, booze, and candy. You can’t beat that! Sis and her hubby were very good to me. In addition to the cool new fishing hat (with matching T-shirt and sweatshirt), they gave me cash to cover the purchase of the Canon camera for camping treks. In addition, I received a number of treats like 22 ounces of the beloved “veggie chips” from the Whole Foods store and some kosher barbecue sauce. Also, they gifted various types of olive oil. One of them is roasted onion. Hmmm… That will work great for some kind of camping recipe. Dad was happy with what he got for Christmas. He received a number of gift cards, a new razor, and some cool books. In addition to the Star Trek trivia book, Dad also gave me some money for the holidays. It’s going on my gift card for the Kum and Go gas station… The funds will be used for a winter camping, sledding and trout fishing trip! The presents were nice but it was each others’ company that we really enjoyed. Our family has just four members left. I hope we still have four remaining by this time next year. Not every family is that lucky near the holidays. Sadly, Dad’s neighbor lost a family member today. The neighbor lady’s father was from Elkader in northeast Iowa. I’m going to drive Dad to the funeral early next week… Since it’s about 15 minutes from that fantastic trout stream (Bloody Run) the collapsible fly rod is going with! I’m a Harris… We fish no matter what the circumstances. The only difference is this time I will probably remember Dr. Block’s lectures should I curse while accidentally embedding a #20 treble hook under the fingernail again… &%^$*!!!! What a beautiful scarf!!! What stitch is that? It was called the diamond stitch. I looked and the pattern is still online at this URL. It is a fun project. My sister loved the scarf and says she’s used it a lot.